With Christmas right around the corner, I decided to bust out a newly acquired glitter from the China Glaze winter collection.. I couldn't decide whether I should put it over white, black or gold.. Maybe even green.. I finally decided on red as it seemed more, ehm, festive? Annnd I realize NOW that I didn't snap bottle shots. I'm soooorry!! I.O.U! I used a base of Essie Lolipop followed with 3 coats of China Glaze Twinkle Lights. This was a tad strange to apply. For whatever reason, my index and pinky fingers are glitter bombed, and the rest of them look 'meh' - same amount of coats and everything. I even noticed it while painting and I didn't do anything differently. 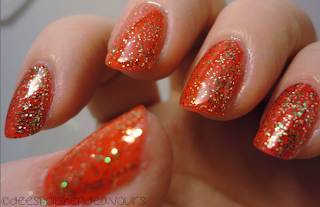 It is a fairly basic glitter - yet it is fun because it is all Christmas-like.